Once you put on a necktie, you need to find a way to keep it in place, and to keep it from "flying" all over the place in the wind. Wouldn't it be perfect if you had a tie-tack or tie-bar which also had the same company name or logo as the corporate necktie you were wearing? Well, unfortunately, I don't have a tie-tack or tie-bar for each and every corporate necktie in this collection. But I have collected a few, and thought you might like to see them here. This first one obviously looks like a bottle of Budweiser beer. 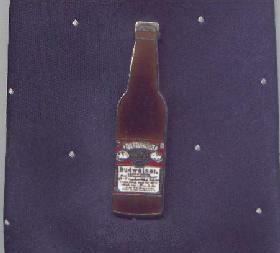 It would look good on any of the Anheuser Busch or Budweiser neckties in the "Beverage" gallery, except the long one in the shape of a Budweiser bottle. 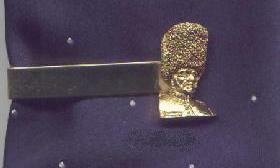 The Beefeater tie-bar would be just the thing on the Beefeater necktie in the "beverage" gallery, don't you think? The Campbell Soup necktie in the "Food" gallery might be too busy for this silver tie-bar to be fully appreciated, but it is perfect for the Campbell necktie, since they have the same "M-m-m Good" phrase on both of them. 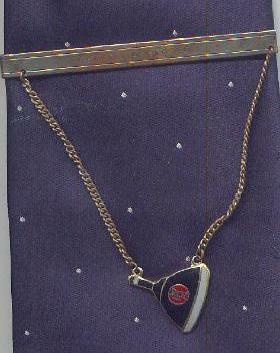 This tie-bar with a small golden Coke bottle on it would probably go with any of the Coca Cola necities in the "Beverage" gallery. While a couple of the McDonalds neckties seem too busy for this McDonalds tie-tack, it would look good on several of the tamer neckties. The large HU below the golden arches stands for Hamburger University, where McDonalds managers are trained. Wouldn't you just know that, while I have a nice silver Boeing 757 tie-tack, the two Boeing neckties in the "Airplane" gallery would be for the 737 and 767! Well, It will still look good on the plain Boeing necktie. I think this small airplane is a Cessna, but could be from another manufacturer. It does not have any identifying marks, except some small diamond shapes on the tail. 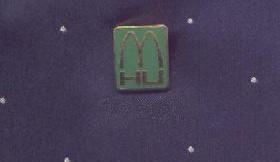 This McDonald Douglas tie-tack is specifically for their astronautics Division, and I think it is just the thing for the second McDonald Douglas necktie. This Mitsubishi tie-tack will look just fine on the one Mitsubishi necktie in the "Airplane" gallery. Here are some miscellaneous tie-bars for your consideration. They cover a number of industrial companies. This first tie-clasp has a Champion spark plug on it that almost looks like the real thing. The Crane company makes a variety of plumbing items, and this tie-clasp features a valve, not much different from the one you hook your garden hose up to. 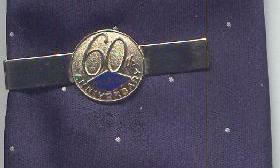 I don't know when the Goodyear tire company celebrated their 60th anniversary, but they issued this tie-bar to commerorate the occasion. This tie-bar has a RCA television picture tube handing from it. Given that we are now well into the flat screen TV era, this is probably a collector's item? The second one represents the AT&T Long Line Division. 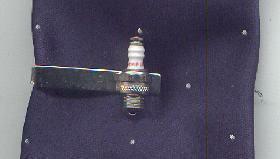 The third tie bar, with the truck, has the name “Spies Bros, Inc” on the back of the clasp. 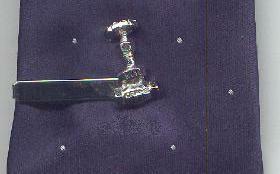 The fourth tie bar, the drafting T-square with the K&E, represents Keuffel & Esser, a long-time manufacturer of drafting equipment and slide rules. No one needs to tell you that the last of these items is a Volkswagen car key.